Most wind turbine and hydro permanent magnet alternators output three phase alternating current (AC) electricity. In order to get this generated power into a battery bank, it must first be rectified into direct current (DC) electricity. Through our website we have many articles which explain how you can put together a suitable bridge rectifier ranging from the DIY from scratch Make a Bridge Rectifier from Diodes to our guide to Building Your REUK 3 Phase Bridge Rectifier (which describes how to make the final connections for the complete kit we sell in the REUK Shop). 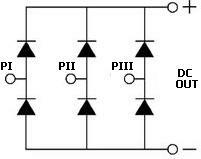 However, rather than using individual diodes or one (or more) bridge rectifier per phase, three phase bridge rectifiers are available with five contacts – one for each phase from the alternator, and the positive and negative outputs. 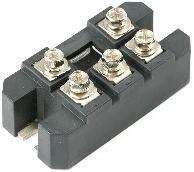 Pictured above is one such three phase bridge rectifier rated at 60 Amps and a maximum voltage of1200V. It has dimensions of 8 x 4 x 2.5cm and was listed for sale on eBay*. * Note that these are extremely rare on eBay UK, so expect to pay international delivery on your purchase. Similarly the unit pictured above was also found on eBay and is a 100 Amp rated three phase bridge rectifier manufactured by Toshiba and offered for sale in USA (but with international delivery offered). NEW Pictured above is the best price (January 2011) three phase bridge rectifier available on ebay. Rated at up to 1000 Volts, and designed for use with AC generators producing less than 35 Amps (continuous duty), this bridge rectifier is sold for around £5 plus £3.50 for air mail postage. (If you purchase more than one, the additional postage cost per unit is just £1.75.) A central mounting hole is provided for easy connection to a heat sink – it is suggested that any thin piece of metal at least 3 x 3 inches in size will do the job. This bridge rectifier as well as other larger rectifiers, large schottky diodes, and wind turbine generator components and controllers is available from Windy Nation. The best search to use to find these components is 3 Phase Rectifier (click here to search now – there were over 20 listed at the time this article was last updated in January 2011). Note that you may also find a couple of suitable bridge rectifiers listed as Three Phase Rectifier.